Last weekend, I set the Hubby on a quest for fresh ham–that is, raw uncured pork leg. He called our go-to grocery store, where we got the meat last November. The very nice man in the meat department told him, “I am sorry, sir. We only carry fresh ham for holidays.” Ummm… have you heard of Easter??? So he made another call. At the buy-in-bulk store, the very nice man in the meat department referred him to the deli. So he made another call. And another. And another. The best answer we got was that it could be ordered for us, and that it would be here in three to four days. (And that it would cost three to four times what we paid for it in November.) Not gonna work. Fresh pork has to be cured in order to turn it into ham. We cured the 10 pounder for 5 days. Still determined, I returned to last November’s recipes, and found a suggestion that you don’t really need to use leg meat for ham–that’s just what had been traditionally used. Loin is a great cut of meat that makes fantastic ham. Great! Loin is easy to find! Off the grocery store I go in search of the biggest baddest pork loin there is. 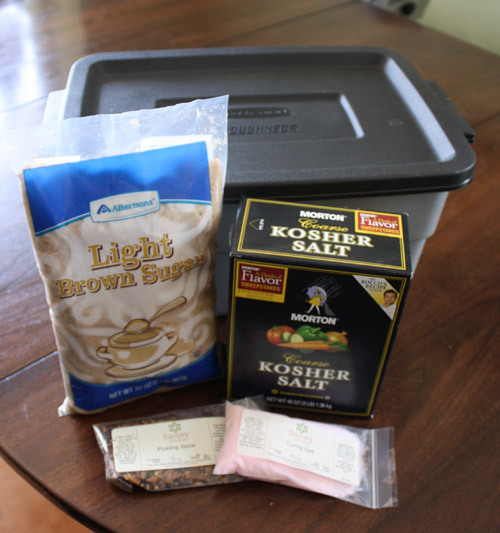 I found a six pound pork loin roast–two of them! On sale! I snatched them up and headed to check out. On the way home, I went to Savory Spice to pick up curing salt and pickling spice (and, as always, a nice foodie chat with the staff–next I’ll be making my own corned beef, btw). I headed home to my laboratory, gathered my ingredients, dug out my thermometer and my cute little 3 gallon Roughneck tub (aka: The Curing Vat), and got to work. The first step is to make the brine for curing. A brine is generally super salty water, mixed with some other herbs and spices and maybe some sugar, in which you soak meat before cooking it. The meat becomes infused with the salty water, which keeps it moist during cooking. There is a very scientific explanation as to why soaking meat in salty water keeps it moist, but it makes no sense to me. All I know is that it works! I opened up the first roast to rinse it… and my heart sank. What was in the package was not a 6 pound loin roast. It was four small pork loins. I opened the second “roast” to find the same scenario. This was all wrong! How could I possibly make an Easter ham out of 8 pork loins?? Undaunted, I proceeded anyway. I put the loins in The Curing Vat, but rather than curing them for six days, which is about right for one 12 pound piece of meat, I cured them for 48 hours (turning them half way). Then I cut a small piece off of one of the loins and cooked it up–delish! There was plenty of salt content already, so I dumped the brine and soaked the meat in cold water overnight. Ugliest ham ever (but delicious)! But how was I going to pass off 8 pork loins as a ham? I tied them together. Using some silicon rubber bands (very cool idea, but somewhat a pain to work with), I bundled the 8 loins into three roasts. Next step–smoke! I coated them with a fantastic homemade BBQ rub that Hubby makes, then I let him work his magic. 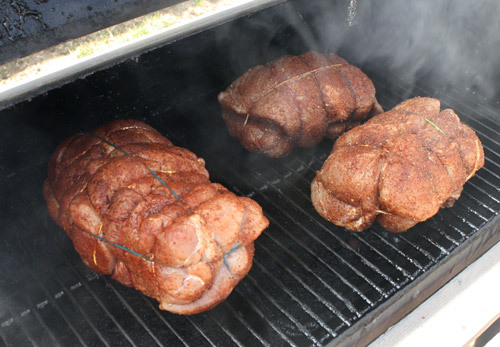 Overall, we smoked the “hams” for about two hours, then cooked them in the oven on 275 for another 4 hours. In the end, we had delicious, salty, smokey “ham”… even though we never actually found fresh ham. Below is the recipe for a real ham, and in italics are the adjustments for loins. If you don’t have a smoker, this would be equally as delicious cooked in the oven alone. Fill your tea kettle with water, and get it boiling. Pour that into a one gallon pitcher. Add the dry ingredients, and stir until they’re dissolved. Add about four cups of ice to cool the mixture down. Using the meat thermometer, take the water’s temperature. Keep adding ice until it gets down to 38-40 degrees. Fill the pitcher up the rest of the way with water, being sure to keep the temperature down. If the temperature goes above 40 degrees, pour out some water and replace it with ice. Cover the bottom of your Curing Vat with about an inch of the brine. Rinse the pork with cold water, place it in The Vat, and pour the rest of the brine over top. If the brine doesn’t cover the meat, add more water until it is completely submerged. You need to make sure the meat stays completely submerged in the water during curing, so weigh it down with your heavy sterile thing. Cover The Vat, and stash it in the fridge. Remove the meat, and discard the brine. Rinse the meat and The Vat. Return meat to The Vat, and fill with cold water and ice (again, maintaining a water temperature of 38-40 degrees). Soak overnight. Remove meat from water, and pat dry with paper towels. At this point, you can rub the entire piece of meat with BBQ rub, if desired. If not, season with salt and pepper. Preheat oven or smoker to 275 degrees. Cook ham for about 30 minutes per pound, or until internal temperature reaches 145 degrees. If using a smoker, smoke for two hours, then move to the oven. Feel free to baste with your favorite glaze for the last 30 minutes. 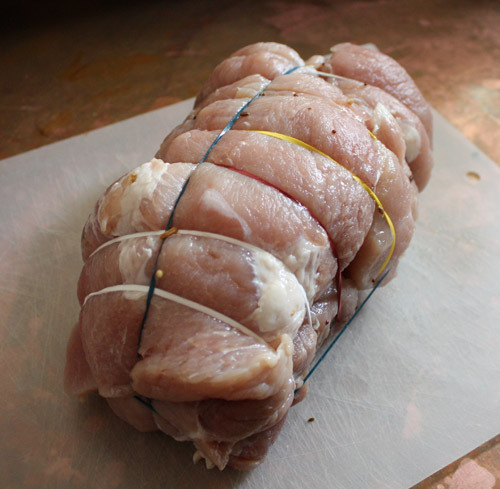 Allow to rest for 30 minutes before carving (15-20 minutes for loin “roasts”). Sounds like a great recipe but it’s so much easier to buy them already cured! My mother used to make special cheese for Easter too that seems to me to be more work than the deli.